When reviewing a Pixar movie, it is nearly impossible not to open up a dialogue about this powerhouse company of the animation cell, however superfluous a dialogue is at this point. Who doesn't know what Pixar is at this point? When Toy Story came out twenty years ago (wait— twenty years ago?! ), it completely revolutionized the public's perception of what an animated movie— and perhaps even what a movie itself— had the potential to be. Toy Story was an amazing film, from its groundbreaking animation to its memorable characters to its snappy dialogue (which was humorous and contemporary without being irritably "hip"— take notes, DreamWorks!) And, astonishingly, Toy Story wasn't the company's swan song: Pixar delivered excellent films for almost a decade before tripping over its over-inflated ego. Since The Incredibles, Pixar has been inconsistent: for every Ratatouille, there is a Cars; for every Up, there is a WALL-E (I'm sorry to burst your bubble, fan boys, but WALL-E is a terrible movie). Even its better ventures like Monster's University were startlingly mediocre in comparison to the cosmic heights Pixar had reached with its early films. When Inside Out, the first Pixar movie to be released since Cars 2 (the only Pixar film to get a negative score on Rotten Tomatoes), was released, critics heralded it as Pixar's return to brilliance. Is it all that it's cracked up to be? Inside Out begins with the birth of Riley Anderson (Kaitlyn Dias) and, simultaneously, her emotions. Joy (Amy Poehler) is Riley's first emotion and the leader of Headquarters, the hub that controls Riley's mind, thoughts, feelings, actions, and ideas. Headquarters is also staffed by hothead Anger (Lewis Black), worrywart Fear (Bill Hader), fussbudget Disgust (Mindy Kaling), and wet blanket Sadness (Phyllis Smith). These five work together to keep eleven-year-old Riley happy, healthy, and safe— with the exception of Sadness, who has no obvious purpose and is often ushered away from Headquarter's control panel. Joy and Riley's perfect lives are obliterated when Riley is moved from Minnesota to San Francisco and the emotions are stuck struggling to find the bright side to the situation. Things are turned upside down when Sadness accidentally touches one of Riley's core memories, which are important moments in her life that support the islands that comprise her personality, and taints it with her sadness. While trying to repair this mistake, Joy and Sadness are sucked out of Headquarters by a memory retrieval tube and deposited halfway across Riley's mind in the labyrinth of her long-term memory storage. Without Joy's leadership, the three remaining emotions are left scrambling to keep Riley together as she acclimates to the move. Joy and Sadness must return to Headquarters before Riley's personality islands collapse and she loses her ability to feel. Inside Out was unintentionally marketed as Pixar's triumphant return to cinema with its legions of fans and critical approval. And while it is definitely different from Pixar's past efforts, Inside Out is a very good movie even without the Pixar label. It's heartwarming, funny, and intelligent: the qualities that made Pixar a household name. Why is it so much better than everything else Pixar has thrown onto the big screen in the past ten years? There are several elements that make Inside Out good. Perhaps the best is the sheer ingenuity of the ideas presented here. While personifying a person's emotions is far from original (and presenting dreams as subconscious-directed movies was done before in Osmosis Jones, which also had an incredibly creative interpretation of a person's insides), the design of Riley's mind is just fantastic. The abstract concepts of imagination, thought, and personality are made tangible and with considerable attention to detail and creativity. Even if this movie had been mediocre, it still would have received well-deserved adulation for the imaginative presentation of a person's mind. One of the few tired tropes utilized in this movie is the buddy journey, Pixar's favorite plot device. Whether it's Marlin and Dory crossing the ocean to find Nemo or Mike and Sully lobbying for the most attention from their professor, Pixar will always find a way to stick two unlikely characters together and send them on an important journey. These two characters are the aforementioned Joy and Sadness, voiced expertly and animated wonderfully. While Joy can be a little over-the-top and occasionally even inconsiderate, she is still a jubilant, fun character whose optimism is a great foil for Sadness's unflagging pessimism. Sadness herself is actually a funny character whose gloomy demeanor fuels some hilariously deadpanned, existential lines. While their journey back to Headquarters is nothing original, the conversations they have along the way make this cliché feel more refreshing. Now, of course, we come to the emotional aspect of the film. Pixar has practically established its reputation on the foundation of giving nonhuman entities human emotions and here, they give…human emotions the human emotions. As funny and cerebral as this film is, it is also intensely touching and brutally sad. I won't dare spoil this devastating moment, but it concerns a whimsical imaginary friend named Bing Bong (Richard Kind) who lives in Riley's long-term memory and dearly misses the days he used to spend with her. The most poignant moment comes in the form of the movie's moral: sadness is necessary. It teaches children that though sadness might not be inherently good or enjoyable, it is what makes us human and enables others to reach out to help us. Inside Out is a beautiful film on several levels. Its colorful animation— on par, of course, with all of Pixar's films— is spellbinding, its gentle score is wonderful, and its writing is intelligent and philosophical (to the point where there are some scenes, particularly a tangent about figurativeness and dimensions, that most kids won't understand). While Pixar has started to fade with the emergence of new animation companies with equally ambitious first films, particularly Laika, Inside Out proves that even twenty years later, Pixar hasn't lost its heart— or its mind. 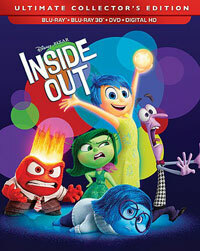 Inside Out gets all emotional on Blu-ray Disc courtesy of Walt Disney Studios Home Entertainment. The film has been letterboxed at 1.85:1 and the Disc contains an AVC 1080p HD transfer which runs at 23 Mbps. The image is very sharp and clear, showing no grain or defects from the source materials. The colors look amazing, and could easily be considered the real stars of the film, as the blues are quite bold. The image is never overly dark or bright. The level of detail is very impressive, as we can make out minute touches, and the depth invites us into the movie, even in this 2D version. The Disc carries a DTS-HD Master Audio 7.1 track which runs at 48 kHz and an average of 3.5 Mbps. The track provides clear dialogue and sound effects. Despite being a 7.1 track, the bitrate here doesn't get above 4.9 Mbps, even during the big explosions. Is this because there are five other audio tracks, including a DTS-HD 5.1 one? The audio provides detailed stereo and surround effects in which we can make out individual sounds. The sounds move smoothly from left-to-right and front-to-back. The subwoofer effects are palpable and engaging. This set also includes a Blu-ray 3D where the film has been letterboxed at 1.85:1 and the Disc contains an MVC 1080p HD transfer which runs at an average of 22/7 Mbps. The image is very sharp and clear. The first thing that jumps out here are the colors. 3D versions are notorious for being dark, but not this one, as the bright colors look just as good as the 2D Disc. The depth is good and there is notable placement of objects in the foreground. However, I didn't note many "coming at you" effects, even in scenes where things are moving towards the camera. The Disc carries a DTS-HD MA 5.1 track which runs at 48 kHz and (oddly) a constant 2.0 Mbps. The audio is acceptable, but not overpowering. The Inside Out Blu-ray Disc contains a ton of extras, which are spread across two Discs. Disc 1 kicks off with an AUDIO COMMENTARY from Director Pete Docter and Co-Director Ronnie Del Carmen. "Lava" (7 minutes) is a bonus short that accompanied Inside Out when it played in theaters, which is letterboxed at 2.35:1. "Riley's First Date" (5 minutes) is a new bonus short which plays like a deleted scene from the movie. "Paths to Pixar: The Women of Inside Out" (11 minutes) offers comments from the various females involved in the film who talk about their career aspirations and how they got where they are today. "Mixed Emotions" (7 minutes) examines how the filmmakers focused on the specific emotions used in the film and how those characters were designed. This also gives us a glimpse at some characters which weren't used. Disc 2 gets up and running with "Story of the Story" (11 minutes) focuses on the origin of the film's plot and how it was developed and changed over time. The production design and the look of the film is acknowledged in "Mapping the Mind" (8 minutes). "Our Dads, The Filmmakers" (7 minutes) is a mini-documentary made by the daughter of the director and the daughter of the composer, showing what their fathers do on the movie. "Into the Unknown: The Sound of Inside Out" (7 minutes) shows Sound Designer Ren Klyce and Supervising Sound Editor Shannon Mills creating the noises for the movie. "The Misunderstood Art of Animation Film Editing" (5 minutes) shows Editor Kevin Nolting at work helping to shape the movie. "Mind Candy" (14 minutes) is a reel of very brief interstitials which shows the various characters at work. The Disc contains four DELETED SCENES which run about 17 minutes, including introductions by Pete Docter. These are presented in animated storyboard form and delve into a version of the movie which would have been quite different. The extras are rounded out by three TRAILERS, one of which is Japanese.